Starbucks offers as many (or maybe more) food options today as they do coffee. There’s the pastry case full of treats, the cold case full of bentos, sandwiches and salads, last minute entice-rs like biscotti and chocolate covered grahams and then the shelves and rounders of packaged snacks. How in the wild world do you decide which to pick? The food in the pastry and cold food case is pretty transparent (you generally know what you’re getting and if you want more info, you can get nutrition facts and ingredients on the Starbucks website HERE). BUT, if you’re on-the-go and/or prefer a packaged snack, you have to pick each of them up, check the labels, sort through the information and THEN decide what you want. Who’s got time for THAT? I started with the salty, crunchy snacks and will work my way through the packaged sweet snacks/treats. In order to make the review legit and unbiased, I did an informally formal blind taste test. How it went down: There were 8 blind tasters (i.e. they didn’t know what they were tasting) plus me; 4 adults, 1 teenager and 4 young kids. 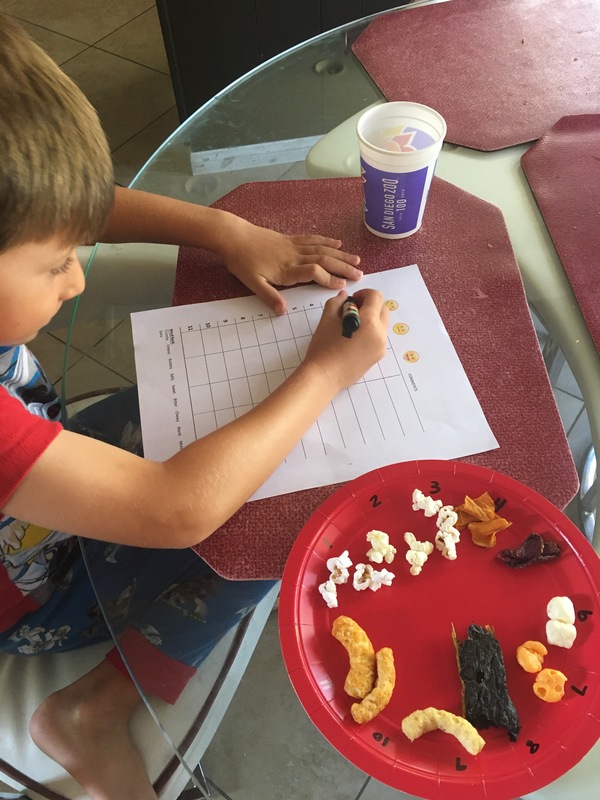 They were instructed to keep comments and opinions to themselves, drink a sip of water in between each sample and to mark the face which best describes their opinion of the snack. They could also (though not mandatory) write a comment or descriptor from the word bank describing the snack. They were then asked to rank their top 1, 2 & 3 favorites. Ingredients: Popcorn, Sunflower Oil, Sea Salt. Taste/Texture: This popcorn is very mildly flavored. It’s salty, crunchy and tastes similar to air-popped popcorn. Nutrition notes: It’s 100% whole grain, low in calories and saturated fat. Even though it didn’t taste overly salty, the sodium content (420 mg) is a bit high for a 100 calorie snack. Still, a good choice for a grab-and-go snack. Taste/Texture: Tastes like your typical pre-popped kettle corn. It’s crunchy, sweet and salty. Nutrition notes: It’s 100% whole grain (providing 3 g of fiber), low in calories (130), saturated fat (0 g) and sodium (130 mg). It has 6 grams of added sugar, much lower than a pastry and most granola bars but enough to reconsider if you’re trying to limit your sugar intake. All in all, if you’re craving something sweet, this is a good choice. Ingredients: Popcorn, corn oil, seasoning (maltodextrin, salt, natural flavor, whey powder (milk), butter powder (milk), dextrose, annatto and turmeric extract). 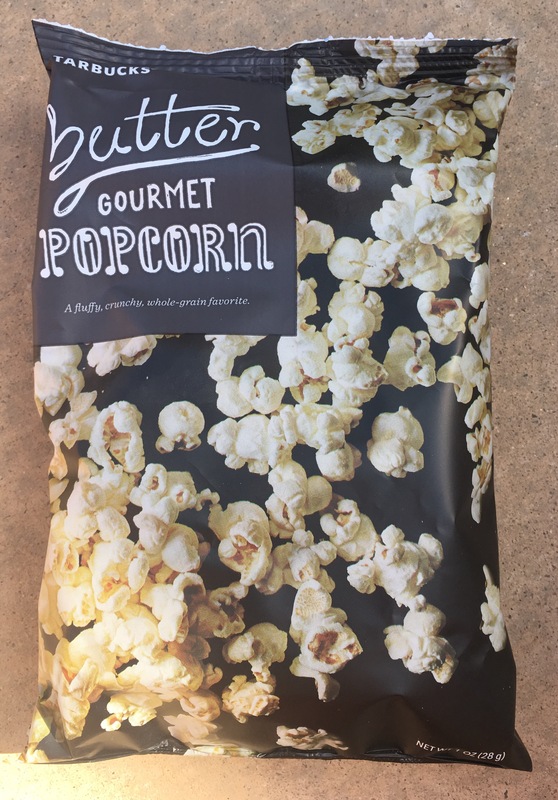 Taste/Texture: Reminiscent of movie theater butter popcorn . It’s super buttery (a couple tasters thought it was cheesy), crunchy, salty, and a little greasy. Nutrition notes: It’s 100% whole grain (providing 3 g of fiber), low in calories (150), saturated fat (1 g) and moderately salty (240 mg sodium). Great for a grab-and-go snack. Ingredients: Sweet potatoes, expeller pressed sunflower oil, sea salt. Taste/Texture: Crunchy and thick, sweet and salty. They were a bit greasy but not beyond what you’d expect from a chip. Nutrition notes: Made from real sweet potatoes, they’re high in fiber (4 g) and vitamin A (180% DV) and low in sodium (140 mg). But be careful…each bag contains 2 servings. So, while you think you’re getting a 150 calorie snack, you’re really getting 300 if you eat the whole bag. Taste/Texture: Crunchy like Cheetos but bigger like a cheese puff. A little spicy, salty and flavorful. Initially, they are sweet with a spicy chili aftertaste…reminiscent of a sweet and spicy BBQ. Nutrition notes: 130 calories, 5 grams of fat and 0 grams of saturated fat. You get 3 grams of fiber, 4 grams of protein and only 170 mg of sodium…great for a grab-and-go snack. Taste/Texture: Very crunchy and dense, the texture is like a cross between Pop’s cereal and Corn Nuts. Initially, it’s mildly cheesy with a stronger cheese after taste. Nutrition notes: One serving (9-10 pieces) is roughly the same as eating 1 part-skim string cheese (100 calories, 7 g fat, 4 grams saturated fat). Buyer beware…each bag is 3 servings so, if you eat the entire bag, you get 3 times the calories and fat. That’s pretty high for a snack. But, if you stick to 1 serving, it’s an OK choice. Taste/Texture: Very crunchy and dense, the texture is like a cross between Pop’s cereal and Corn Nuts. Very strong cheddar cheese flavor and even stronger after taste. Nutrition notes: One serving (9-10 pieces) is roughly the same as eating 1 part-skim string cheese (100 calories, 7 g fat, 4.5 grams saturated fat). Buyer beware…each bag is 3 servings so, if you eat the entire bag, you get 3 times the calories and fat. That’s pretty high for a snack. But, if you stick to 1 serving, it’s an OK choice. Taste/Texture: Crunchy like Cheetos but bigger like a cheese puff. Strong “spice” flavor and salty, a cross between BBQ and Mexican flavors. Nutrition notes: 130 calories, 5 grams of fat and 0 grams of saturated fat. You get 3 grams of fiber, 4 grams of protein and only 150 mg of sodium…great for a grab-and-go snack. Taste/Texture: Light, airy texture, mild crunch initially but then gets chewy. Salty, earthy and bitter. Looks like dried leaves and tastes like kale. Nutrition notes: The entire package is 100 calories, 9 grams of fat and 0 g saturated fat. It’s another 2-servings-per-package snack so you have to double what’s on the label. Sodium is high (500 mg) for a 100 calories snack but otherwise, it’s fine. You get large dose of vitamin K, some calcium and iron because it’s a bunch of kale. Taste/Texture: Earthy, bitter, and beet-y, particularly in the aftertaste. Tastes like it’s freeze dried but it’s hard, thick and crunchy like a vegetable chip. Nutrition notes: 100 calories, 0 g of fat and 5 grams of fiber. Hard to beat (ha) a single ingredient packaged snack. Taste/Texture: Crunchy like Cheetos but shaped bigger like a cheese puff. Not a ton of flavor and was a bit chalky and bitter. Nutrition notes: 130 calories, 5 grams of fat and 0 grams of saturated fat. You get 3 grams of fiber, 4 grams of protein and only 135 mg of sodium…great for a grab-and-go snack. Starbucks is constantly shuffling their snack selections so these may not be EXACTLY what’s in your store. Feel free to let me know if you’ve found a salty, crunchy snack at Starbucks that you love. I’d love to hear from you. Stay tuned for Part 2: Fruit snacks, nuts and more! Also, if you’ve tried and like any of the snacks above, you can purchase them in multi-packs or larger bags on Amazon by clicking the product names above.